Kathryn has been dancing since 2001 and has trained in all genres. Having travelled both nationally and internationally dancing with Entertainment Unlimited, Kathryn has found a love for performing, teaching and choreography. Kathryn graduated from QUT with a Bachelor of Fine Arts (Dance) in 2017, as well as completing her CSTD Modern Jazz Diploma & Tap Diploma. 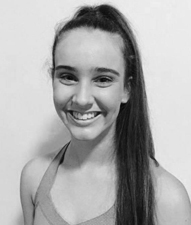 In 2018, Kathryn commenced studying a Maters of Teaching at QUT (Secondary), to broaden her knowledge of teaching and dance. She enjoys teaching all ages, sharing her love of creating and performing dance with the upcoming generations.